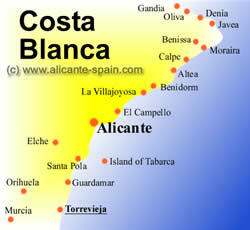 For most tourists, the city of Novelda will be a bit off their normal route plans as it lies around 25 km west of Alicante. 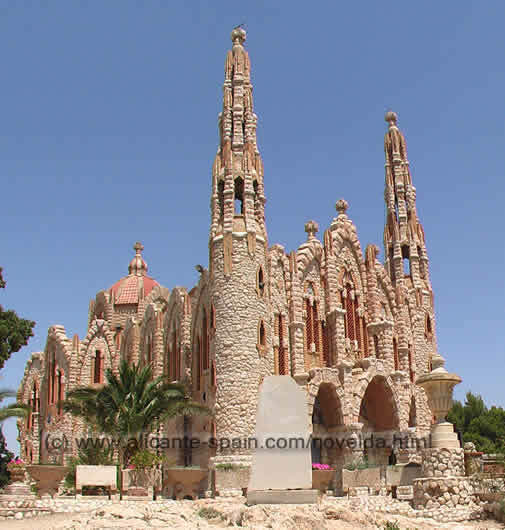 Novelda highlights its city and the sanctuary of Santa Magdalena for the true Costa Blanca traveller. To get to this area you can take the E-7, lets call it the motorway, from Alicante (in direction Madrid). Luckily it has its own exit so you are there within 20 to 25 minutes by car. Your first stop should really be the city center of Novelda. Being famous especially as the “Spanish capital of marble”, Novelda hosts the Spanish marble industry. It caught my eye to see so many perfectly decorated marble buildings. And in addition to this, the city is well known for its vineyards and large saffron fields. Lots of 17th century architecture can be seen around any of the main city squares- “plazas”. Apart from having a beautifully restored facade which belongs to the magnicent the city hall, the church of San Pedro is right next door and both are the ideal starting point for a nice walk around the old town streets. 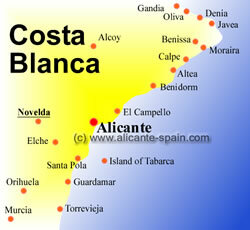 Located inland from the Costa Blanca coastline, Novelda is best reached by car. 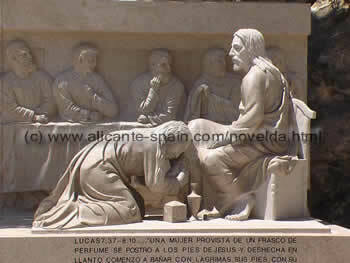 The church of San Pedro in Novelda center. Next to many well conserved houses you will find plenty of bars (just to stop by). Ask for the Calle Mayor (Main street) where the Gomez Tortosa cultural center is located at no. 6. In this building you will find the Novelda tourist information office which provided me with a very good map of Novelda. 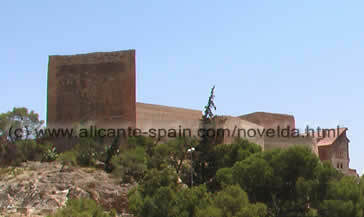 After discovering some of the beautiful attractions in Novelda, you really might want to make sure you drive about 3 km to the northwest to the Castle of Mola ( Castillo de la Mola ) and the Sactuario de Santa Maria Magdalena. 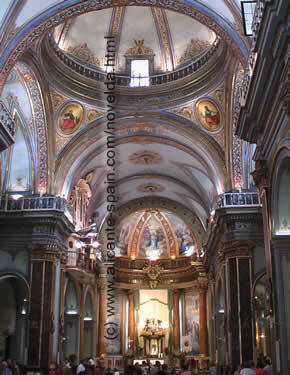 The Sanctuary is certainly one of the most impressive churches I have ever seen around the Costa Blanca. It reminds me a lot of the architecture of Gaudi in Barcelona. Next to it you will find the remains of the medieval castle of Mola with its triangular tower. The castle of La Mola with its impressive triangular tower lies behind the sanctuary. Picture underneath shows an impressive marble monument right beside the sanctuary. Just a little sidenote from me for those of you who plan to see Novelda during your summer vacations. You’d better visit the city during the morning hours up until 14h or later in the evening, because especially during the summer months it can be very tough to stand the hot temperatures. 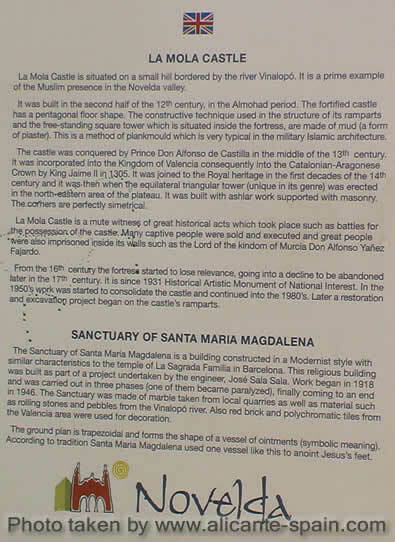 Excellent descriptions about the castle and the sanctuary. Make sure you be at the castle before 13h, because it closes early. To sum it up: Novelda and the area around is a wonderful place to visit for a day. The impressive and breathtaking architecture of the sanctuary should be one of the outstanding landmarks for everyone who visits to see. More of the beautiful charm and landscape of the Costa Blanca can be contemplated by exploring the countryside away from the coastal tourist areas.